Wow, I didn't realize it has been that long since my last post. Unfortunately I haven't gotten to do much crafting to actually finish anything because of work. I'm having to work 7 days a week starting this week until Christmas! YIKES! 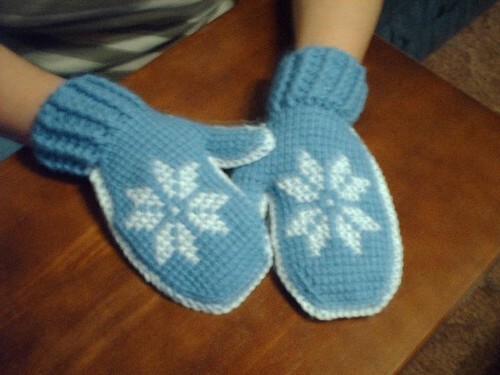 But, I did finish the Bunny Slope Mitts from the newest issue of Crochet Today on my lunchbreak at work today. I was so excited about these. They are so soft and thick! This is the 2nd Tunisian Crochet project I've ever done. Mine didn't come out looking square-ish like the ones in the magazine which is good because I didn't like them like that anyways. So maybe I wasn't doing the Tunisian right but turned out for the better? Not sure on that, but either way they turned out awesome and I love them! I wanted to make the ladies at my church each a pair of these but because of work, they may end up getting them for a New Year's present. That's even if I have time to even start on any of them. I hope everyone is busy crafting for the holidays and can't wait to see y'alls finished projects! Merry Christmas from my family to yours and be safe!